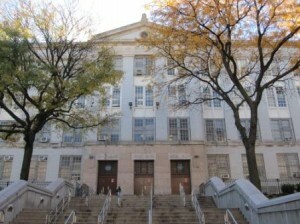 The Bronx High School for Medical Sciences was established in 2002 in the heart of the Bronx, NY. Historically the site of the former Taft High School, the area has a history of high drop-out rates and unsafe streets. Through a charter-school format, the High School for Medical Sciences has taken on the city’s reputation and is re-writing their own history. They now offer an academically challenging high school experience to students with a desire to enter the fields of medical science and health careers. Science courses are embedded into all curricula areas. This advanced curriculum allows some students to graduate in 3 yearsThe first three years of study are devoted to the completion of all New York City requirements for graduation and examinations, while the last year is devoted to College Now coursework. Over the course of their high school experience, students will become “resident experts” in a particular field or topic of their choosing and will be required to compile a variety of reports, experiments and artifacts culminating in a senior year presentation to their peers. This advanced curriculum allows some students to graduate in 3 years.